In an interview with The Guardian reported here, Mark Sheahan, the British Library's first inventor in residence, said: "I like to think inventors have moved on from the garden shed. To a degree, we've moved out of the shed and we're now in the office. I'm not sure we like the office, but we're doing it because we have to adapt." We commented that this was a sad state of affairs as shedworking has so much to offer, but Mark is keen to clarify these comments and got in touch with me to set the record straight. "I have nothing against sheds, or the shedworking ethic," he says. The reason I said ‘I like to think inventors have moved on from the garden shed’ was because the media invariably portray all inventors as nutty professors, working in their garden sheds. They try to find the most eccentric, stereotypical (in their minds) inventors as a mechanism to ridicule them and entertain their audience. This non-constructive negativity annoys the hell out of me as we should nurture and support our inventors. It could be a left brain thing, jealousy or a deflect tactic for non achievers. Whatever the reason, we need, in my opinion, to change the mindset of journalists, so that we are accurately portrayed and perceived correctly by the general public. That is why I said what I said. I hope you can understand my reasoning." You can read more about Mark and his work here. Today is the last day to vote for your Shed of the Year as part of the National Shed Week celebrations. Don't delay. Vote here. 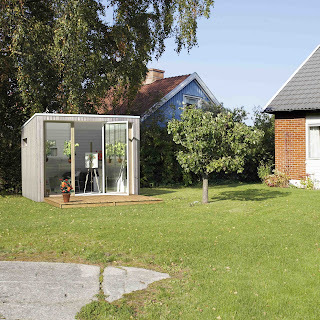 Friggebod = garden shed in Swedish and here are some nice garden offices from Swedish design firm 436 which they call Enkelrum. Planning permission in Sweden is fairly relaxed and something this size - 10 square metres - doesn't require any men with clipboards. 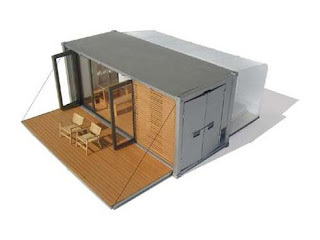 What it does have is a nice deck which folds up to form an impregnable front door, reminscent of some of the container sheds we've been featuring recently. It's a nice site with plenty more pictures and you can play around with the colours online but I'm afraid my Swedish is rather stinky and I can't give you any more details. Japanese architects Mount Fuji had a client who couldn't decide between a new car and a shedlike atmosphere in which to display his ceramics. In the end, he realised it was no contest and this is the result, a snip at 1.5 million yen (which is actually very good value once you convert into the currency of your choice). Thanks to Lloyd Alter at Treehugger for the alert and gracias tambien a los chavales de Noticias Arquitectura. If you liked the look of the Fab Tree Hab which I posted about here last week, you'll enjoy this short video tour of how it might look, inside and out. I'd turn down the volume on your computer first though. England's smoking ban comes into force on July 1 so what many offices will be needing is one of these smoking sheds pictured from Coventry-based Smoking Shelters. 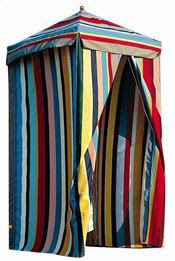 You can get your shelter in a wide range of colours - including a very conspicuous purple - and sizes starting from 2m by 1.5m so that poor old smokers don't have to hover in doorways in the sleet. 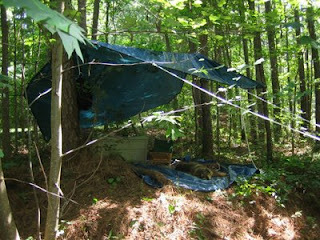 There's also a kind of lean-to option which offers rather less protection from the summer monsoons. 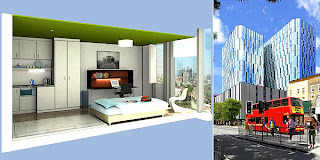 Rather like the Yamaha's MyRoom featured here the Whisper Room is designed as shedworking space within rather than outside your home. It's built from MDF and comes in selfassembly modular units. 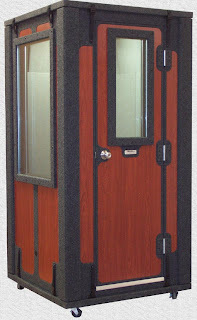 It is aimed primarily at musicians who need a soundproof shedlike atmosphere though there's no reason why accountants couldn't have one in their dining rooms too. Their site has plenty of information about its construction including remarkably detailed flammability data. "J'ai un château sur la Côte d'Azur, qui fait 3,66 mètres par 3,66 mètres." Charles-Edouard Jeanneret/Le Corbusier certainly loved his cabin/shed Le Petit Cabanon in Roquebrune-Cap-Martin (pictured). It was a very simple shedworking space built in 1952 for his wife Yvonne with two beds, a small desk, lavatory and washing facilities (they ate in the little café right next door). Built over six months using rough pine boards for the exterior and plywood and oak inside, apparently his first plan was to use aluminium cladding. It was essentially his last major piece of work, "Not a square centimetre wasted! A little cell at human scale where all functions were considered," was how he described it. And on show at the moment until September 24 in Tokyo's Mori Art Museum is a replica of this famous cabin as part of a retrospective of the great man's work. If you want to see the original one, it's only open Tuesdays mornings and Fridays and you have to book ahead. More details from the local tourist office. In another of the many polls about homeworking, Microsoft recently revealed unsurprisingly that more than 90 per cent of workers want to skiddadle out of the 'traditional' office environment and work from home, preferably in an outdoor location. 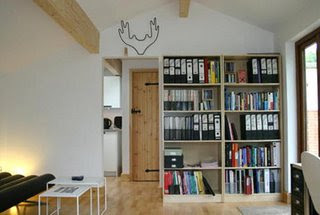 In brief, their research as part of their Mobile Out Of Office initiative (MOOF) suggested that 14 per cent of Brits believed the ideal place to work would be the beach (ha, ha) and 10 per cent said they would prefer to work from their park or garden (which, reading between the lines, obviously means shedworking). But instead of just announcing the results, Microsoft did something rather interesting - they set up a tree office in London's Pimlico Gardens (pictured). At the MOOF blog Mr Moof wrote: "So, here I am and I have to say, despite the slightly breezy weather and the threat of rain, I’m enjoying the fresh air and the liberation and finding myself curiously motivated to work!" James McCarthy from Microsoft Windows Mobile said: "The tree-office shows businesses that it is possible for workers to be free from their desks and still be able to work, and employees that their dreams of working outdoors can be realised. In fact, mobile working is all about being liberated, having more control over your day and at last more freedom in your life." 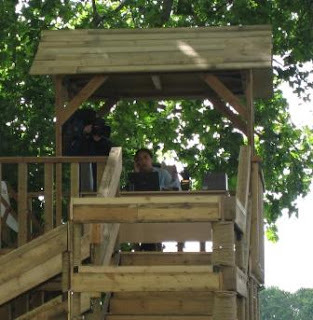 Sadly it's not a permanent move and they've now dismantled the treehouse and donated it to a school. But it's certainly a step in the right direction. 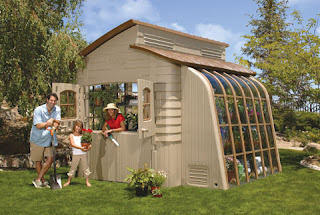 When we've talked about crossover sheds before, it's usually towards the shed-home end of the scale. 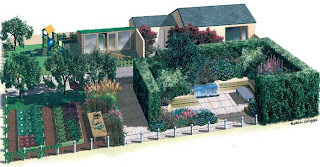 Detroit-based Thinking Outside have an interesting structure called The Smart Gardener's Workshop more towards the potting shed end which, in the right conditions, would also be a great place to shedwork. It measures 11ft by 10ft by 12ft, has double-wide dutch doors at both ends, two built-in skylights and, naturally, garden hose access. You have to build it yourself though it comes with full instructions. More details here. The Hampton Court Palace Flower Show is on from July 3 to July 8, but it doesn't look like it will be a classic year for garden offices this time round. One that does stand out is the Centrepoint garden (Designer: Claire Whitehouse, Contractor: The English Garden Company), pictured. As well as being highly worthy, catering for socially excluded homeless youngsters, there is a shedlike building at the back of the garden which is both an information and chillout area. No pictures yet, but Jacqui Prout's Try This At Home garden says it will feature "a shed and workspace for dad" which sounds promising. Tatton Park's show, July 18-22, is even more lacking in garden offices though I like the look of Forest Fusion, designed by Phillippa Probert and sponsored by, among others, Bartholomew Contemporary, whose clever glass studios we've featured previously on this site. 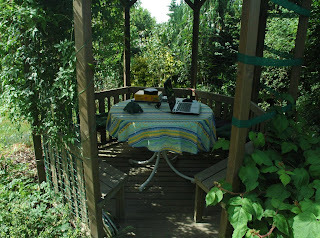 The garden is an urban forest which claims to be ideal for work because of its seclusion. In the centre is a glass pod with smart glass technology which changes its tint to control heat and light to make an interestingly shedlike atmosphere. A fellow homeworker asked me the other day to recommend somewhere along the lines of the Palstone Lodges featured here earlier in the week where she could have a kind of quiet working holiday. She was looking for somewhere in the UK with an internet connection, close to the sea/water and also to a town for basic essentials. All suggestions welcome. To warm your thinking caps, here's Annie's Hut. It sleeps 4/5 people, has a great position on Dunster Beach just down the road from Minehead as well as views towards Wales and the Quantock Hills, has its own fenced back garden, and is close to a village shop for essentials. More details here. 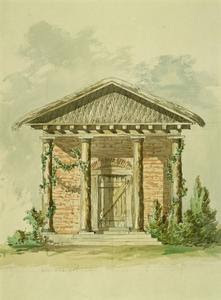 A primitive hut by Sir William Chambers, drawn for George III c.1759 and now in the Royal Collection. * solar powered radiant heating to keep floors "toasty warm in winter, cool cool cool in summer"
I'll definitely be keeping an eye on this one and hopfully posting pictures as it all comes together. No more inventing in the garden shed? The Guardian has a rather sad story today, an interview with Mark Sheahan, the British Library's first inventor in residence. 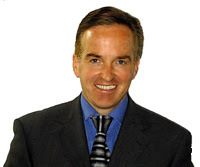 Sheahan says: "I like to think inventors have moved on from the garden shed. To a degree, we've moved out of the shed and we're now in the office. I'm not sure we like the office, but we're doing it because we have to adapt." At a time when increasing numbers of people are in fact RETURNING to the garden shed and garden offices to work, it seems a shame that he doesn't back the shedworking ethic. You can read the rest of the sorry article here. 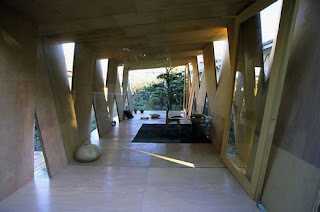 A shedlike atmosphere to start your week with a bang: Gregg Fleishman designed this marvellous DH1 Disaster House which would also make a fine place for shedworking. 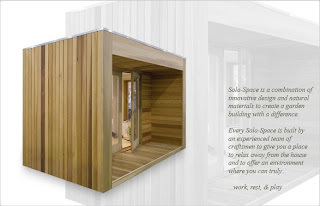 It's 14' square, with a 30" high structural floor and is built with sustainable European birch. Incredibly, the whole thing is assembled without any fasteners. Fleishman describes his work as "Combining fun and functionality to create innovative designs for shelter systems, play structures, furnishings and more" and the site is full of examples. Well worth a browse. 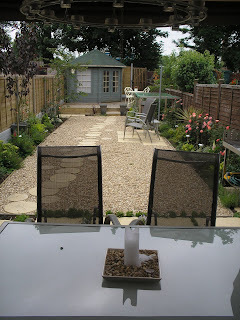 Lynn Fotheringham from Inside Out Buildings and good friend to Shedworking has posted some nice photos of a recent bespoke project at her blog The Office in the Garden. It's always good to nose around somebody's shed. 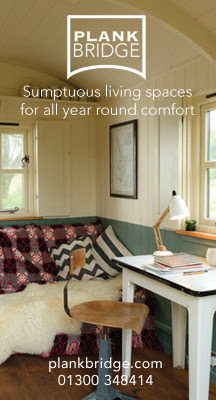 What could be nicer than a holiday in a shedlike atmosphere? 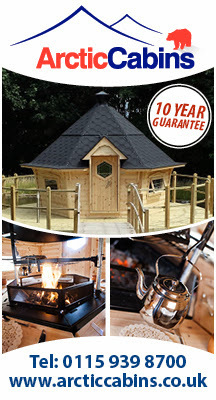 If the thought appeals, take a look at Palstone Lodges. 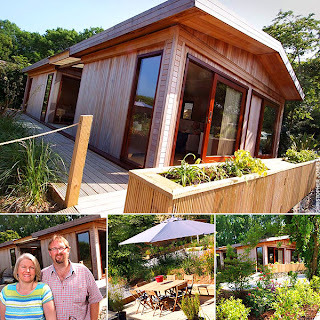 Designed by architects Buckley Gray Yeoman, there are 13 FSC-sourced cedar wood lodges in a kind of shedpark close to South Brent in Devon. Each has floor to ceiling windows and top notch insulation. Inside you've got all you'd want - kitchen (with Bosch appliances), steel baths in the bathrooms, gas central heating, etc, each with a private garden area. The lodges themselves come from Retreat Homes, featured on this site here. And if you really like them, you can buy one. Read more about them at the Telegraph's site here. 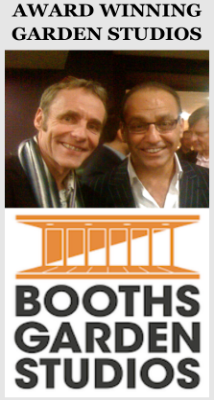 Television property guru and general allround nice person Sarah Beeny has given the thumbs up to National Shed Week. 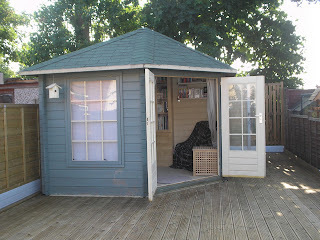 “Shed of the Year is a great excuse to wallow in the gorgeousness of all our sheds - and aren’t they all fine!” she told Uncle Wilco over at readersheds.co.uk. For more details go to the Shedblog. This is the All Terrain Cabin designed by Canadian design collective Bark. Rather than a simple garden office for shedworking, it's an inspiration to raise the profile of Canadian design, what Bark call "a cabin for the 21st century", and is on tour around the world. Indeed, you can't even buy one. 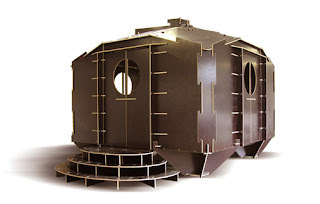 The idea is that this could support a family of four (and pet) using its own supply of water, heat and power. 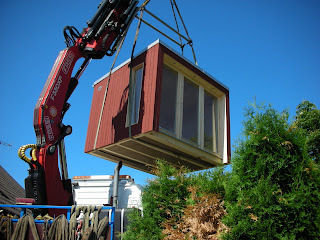 Essentially, the whole thing just folds up – the bedroom ﬂoor and outside deck fold up to become side walls – and is transformed into what looks like an ordinary shipping container to be shipped wherever you want. More details from Bark here. Following up the post earlier this week on gypsy caravans, Homelidays has a nice option for those still wondering where to spend their summer holiday near the River Loire from £322 per week. 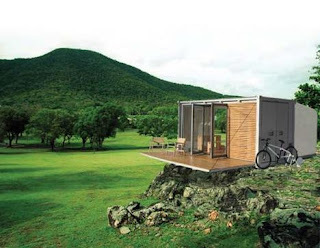 The “House on Wheels” in Burgundy is surrounded by an orchard and overlooks a lake. Equipped with all modern amenities, it includes a DVD player and has internet access. 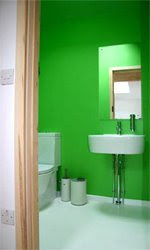 The property sleeps 4-5 people and includes games for children, a baby cot and a high chair. The nearest major town to the property, La Charité-sur-Loire, is a charming historic walled town which boasts magnificent views over the river Loire. 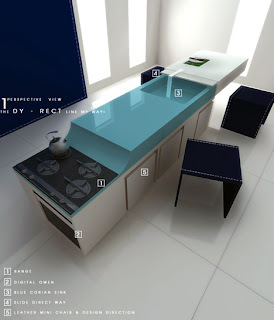 "When George showed her the plans for the studio it reminded her of Jamie’s plans for that machine to catch Santa Claus. But there it was, at the far end of the lawn, foundations laid, five rows of bricks, window frames stacked under blue plastic sheeting." 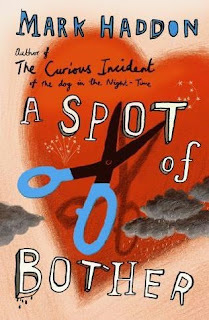 More details from Mark Haddon's engaging site here. The only other recent book I can think of which features something similar is Beyond Black by Hilary Mantel in which a shed does indeed play an important role. 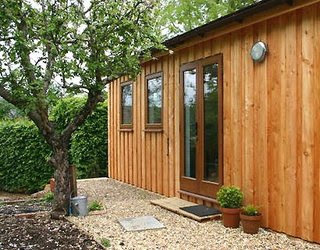 If you can think of any other fiction in which garden offices/studios/sheds play a part, however small, please add your comments below. 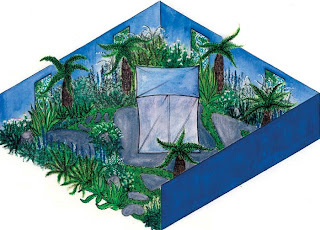 “The hut is becoming the most comfortable dwelling-place imaginable. We have made ourselves a truly seductive home, within the walls of which peace, quiet and comfort remain supreme.” This is how Captain R F Scott wrote about his famous Cape Evans hut in his diary in 1911. Sadly, the hut - pictured by Ian McLaughlin - is now in danger of disappearing: the World Monuments Fund says climate change means the wooden structure - for decades permanently frozen - is now rotting away and becoming engulfed by increased snowfall. Consequently they have place it on their at risk list of the world's 100 most endangered cultural sites. It is hoped the listing will encourage donors and governments to back essential conservation work which is estimated at around £3 million. Sir Edmund Hillary is among those trying to raise funds. "The British should take a little more interest in them. To find now that these relics of a heroic age are barely supported by Britain is just a little bit disappointing," he said. Earlier this year, the UK government promised a £250,000 grant to help save the hut. The hut was built using supplies brought from New Zealand and took two weeks to construct. The walls of the hut were insulated with seaweed and it was nicely kitted out with a pianola, records, and even a printing press to publsih the expedition’s newspaper. For more information go the Heritage Antarctica site or if you'd like to visit a replica, Kelly Tarlton's has a lifesized one. More details here. Are you ready for the first ever National Shed Week? 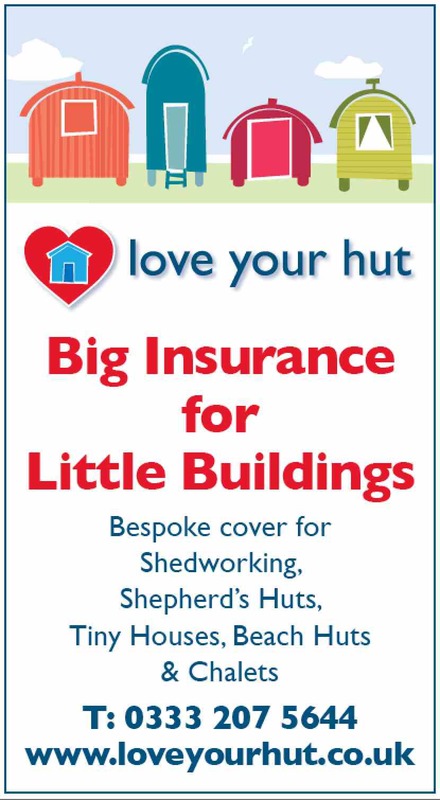 Nearly 700 sheds have a chance of winning the prestigious Shed of the Year 2007 award, with the winner taking away a Taylor's Garden Building shed as a trophy. Overall, more than 2,500 votes have been cast and they are still coming in for the various categories, from the humble garden shed available from any DIY store to unique wooden buildings, posh garden offices and even a surprising number of TARDISes. To vote, go to the Shed of the Year site now. If you're passing through Berlin over the next year, you'll have a chance to visit the famous Loftcube (read more about it here) by the private lake of the historic villa Haus am Waldsee. The Haus is open 10am-8pm, the Loftcube 2pm-3pm or by appointment until July 1, 2008. The Solo Space web site is still under construction as I type but here's a picture of what their main model looks like. More details soon. 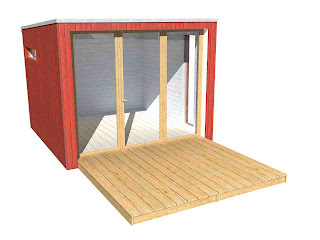 Next to the garden office is a secure shed/storage area 10' by 4' with no windows and deadlocks to the door. For more details, click here. 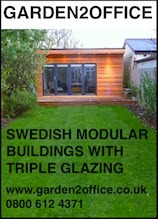 Some garden office suppliers provide a kitchenish area for you as one of their options. But how about this marvellous idea by Wiwat Pitakpongsanit showcased on Yanko Design as an alternative? 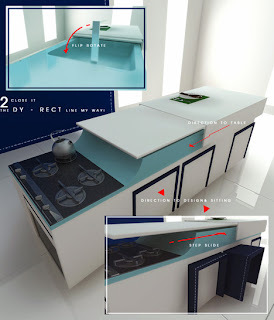 The idea is that instead of a workspace AND a kitchen, you combine them. So you can have your bacon and eggs, work like a demon, then enjoy a nice cheese and apple sandwich for lunch, all without moving from the spot. "It will soon be illegal to smoke at work - because work is a 'public place'. When I am at home working...I’m at work. My office building in my back garden is owned by my company. Sure, I own the company, but that’s irrelevant. So get this… when I’m in my office working… if I was to smoke… I’d be breaking the law! In my own ******* garden! In an office owned by a company I own! Come on people...this is clearly sheer lunacy." 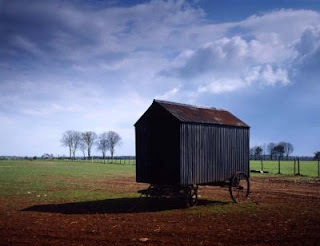 Tin Tabernacles is a lovely archive of corrugated iron buildings, all of which have been documented and photographed by Alasdair Ogilvie over the last 25 years. It has images of many different types of buildings - some of them sadly no longer with us - including various shedlike structures such as the shepherd's hut pictured. Well worth a browse and you can buy any you like on the site too. The Future Shack was designed by Australian architect Sean Godsell (who also came up with the 21st Century Primitive Hut featured here) and was entered in the Architecture for Humanity's relief housing competition as a shelter for refugees and homeless people. 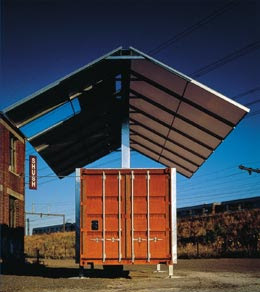 It's built from a 22ft long shipping container, is completely selfcontained and can be stacked easily for transportation. It's run by solar power with a parasol roof and clever adjustable legs mean it can be placed on uneven ground. Godsell is very definitely a designer with a social conscience. You can read more about him on his site here and an interview in the Guardian newspaper here. 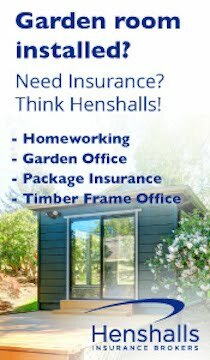 A regular reader from the US contacted me yesterday saying that they were fascinated by the shedworking trend in the UK, but asking why it hadn't caught on in the US, suggesting maybe it was because of permits or small backyards. It's certainly an interesting question, especially in a country where prefab, eco-friendly and modular structures are all the rage at the moment. I'd be very interested to hear the opinions of other readers, especially those in the US. If you thought you'd seen pretty much everything in terms of shedlike atmospheres, think again. 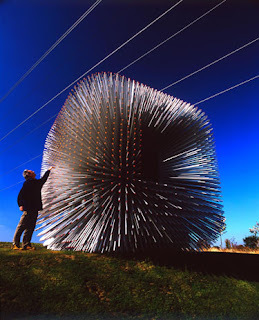 Pictured is the Sitooterie II (apparently from the Scottish, a small building in which you can 'sit oot') commissioned by the National Malus (crab-apple) Collection and put together by the clever folk at Heatherwick Studio. It's a 2.4m cube with more than 5,000 long thin windows - 18mm square-section aluminium tubes glazed with transparent orange acrylic - all over its surface, built from 15mm anodised aluminium. 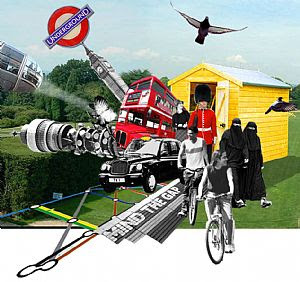 I found this on the intriguing been-seen site which has a marvellous section called Go Cabin. 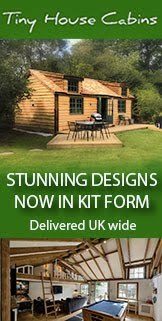 Two new garden office suppliers have recently opened their doors for business. 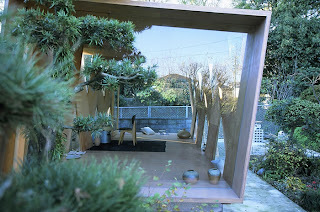 Exo Garden Offices and Solo Space. Their websites are still under construction but should be fully up and running soon. My first impression of the Exo - pictured - is that I like the deck and its nice little side return as well as the floor to ceiling windows. Even if you don't work in a shed all year round, there's no reason why you can't take advantage of the nice weather and work out in the garden. A nice reminder here from the Gray Monk blog of how simple your setup can be. 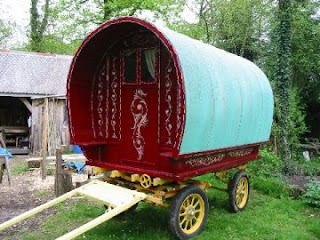 "These highly decorated gypsy caravans are ideal for many uses. 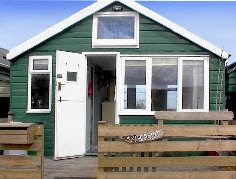 As an office away from the main house they're cosy, warm, water-proof and away from the kids! As an extra bedroom to the house they are perfect. For the artist or writer, they offer peace and tranquility with warmth and light. last but not least, back a horse into one and take off for life on the open road. Nothing arouses that magical feeling that a gypsy caravan does." 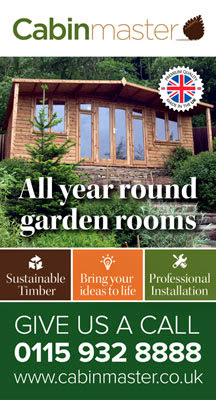 As we get closer to National Shed Week, the coverage is starting to really gather pace. Wilco at the Shedblog reports that the Daily Mirror is planning a double page colour spread devoted to the country's finest sheds. Mirror journalist Matt Roper says he is looking for people who have turned their sheds into something unusual (such as a church, pub, temple, observatory, solarium, etc) - they'll come and take a picture of the ones they like best and have a quick chat with the owners. So please send Matt an email with your contact details by clicking here. Several of you have asked me to describe what you're seeing above. Well, it's a Homestead Timber Building, Marlow model, now nearly four years old, at the bottom of my garden. I'm walking towards it from my house, holding my laptop which contains the camera shooting it. To the left is a nice apple tree from which I brew my own organic cider and at the far end is a small, woodland-type area where we've also added a titchy pond. Those of you interested in gardening might be able to spot some favourites (delphiniums, foxgloves, lupins, etc) although I think the vegetables and fruit (corn, rocket, strawberries, courgettes, etc) are out of sight. In front of the shed I'm growing a small box hedge. Inside the shed you get a brief glimpse of the bookcases, my desk and the view from the window. Music comes courtesy of the birds in the garden (there is a birdbox right by the shed where bluetits have been nesting this year) and Claude Debussy, Arabesque number 1. "Radio infiltrates multifarious architectural spaces, and transmission itself is shaped by the affect architectural and geological forms have upon the path of an FM signal. When we broadcast a field recording we transmit the spectral presence of one architectural space into the physical dimensions of another architectural space and we can even do this in realtime. Its a peculiar form of projection. Especially in sheds." Microsoft is offering a $25,000 home office makover package to one lucky homeworker (who lives in America). Entry is online and you have to write 250 words on why your home office/shed needs a makeover as well as sending in a photo. Video footage is optional. There are also prizes for finalists and semifinalists. Closing date is July 4. There are various criteria for entry, including being between 12’ x 12’ and 20’ x 20’ in size, have high speed internet access, and have no known structural, electric, or safety issues. Click here for more details. If you enjoyed my earthshattering appearance on BBC Radio Gloucestershire earlier this week, you'll be overjoyed to hear that you can get more of me mumbling away on the latest excellent Enterprise Nation podcast talking about shedworking and life/work balance. Click here to go the podcast page. This attractive garden studio belongs to a four-bed detached on at £575,000 in Theberton, Nr Saxmundham IP16. According to the particulars it measures 20’5” x 12’7” maximum then narrows to 8’8” (6.22m x 3.81m to 2.64m). "Looking out on to the sun terrace via a pair of double glazed sliding patio doors. This is an ideal summer house/artists or writers retreat with laminate flooring, ceiling fan, two electric dimplex heaters, double glazed window and door opening to the gymnasium. 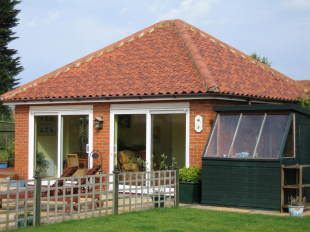 The studio could, subject to the usual consents be converted to a small self contained annexe if required." There's also a gym and hot tub. For more details from Right Move click here. Podliving is the nextdoor neighbour of shedworking and the telegraph has this interesting piece about how students are the latest to be targeted with pods. These are purpose-built for students and stylish to boot. 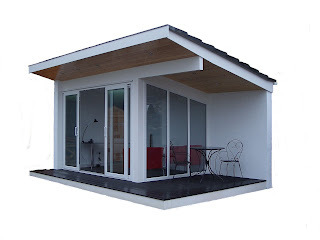 An example is this Nido pod (pictured) with cube models varying from 135 to 184 sq ft.
As long as you’re not in a rush, how about growing your own garden office? Pictured is an example of how it could be done, a design by architects Mitchell Joachim, Lara Greden, and Javier Arbona-Homar which they call the Fab Tree Hab. By weaving together young trees (‘pleaching’), it would be possible to build a shedworkable lattice structure over several years. As the trees mature, vines are grown onto the walls and gaps filled with earth or other plants. Inside, the walls would be insulated with straw and clay. For more information click here. Richard Reames is one of the pioneers of building using trees and grows chairs, tables and other ‘arborsculptures’ at his Oregon nursery/studio and for clients. “Living trees could be grown in such a way as to provide a weather tight structure,” he says. “By planning and encouraging the trees to grow together a solid structure can be grown. The trees could also provide fruit or firewood on an annual basis. These living houses would be almost indestructible and last for much longer than the life of the trees themselves, which could be hundreds or even thousands of years.” More information at his site here where you can also buy a copy of Richard’s excellent book on the subject. 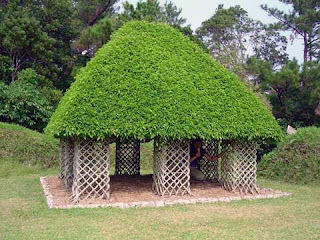 Here's an example of how these living sheds can look, the ficus benjamina house on Okinawa Island. 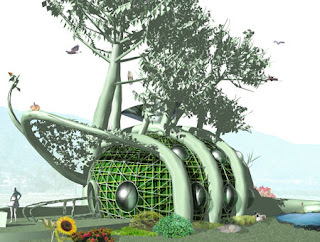 You might also be interested in the Treedome Project.These clever folk have designed latticeworks of tree branches and grown them into cylindrical, multi-room dwellings which become fully-enclosed botanical domes. Fruit and other foods grow on the roof and walls. All these projects have been covered at the marvellous inhabitat here and here. Thanks to our German correspondent Cathy Dobson for alerting me to this. TS1 - the best metal shed in the world? Q. Which country is expecting a homeworking boom?